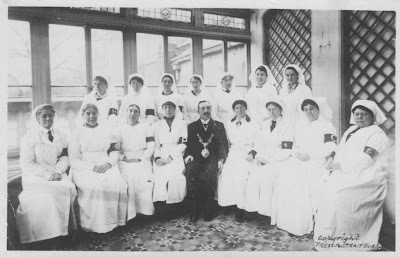 Posted in 1916 from Palmers Green, this postcard is by Barratt's Photo Press Ltd, Fleet Street, London, and shows fifteen nurses sitting either side of a Mayor with a big chain. The message says "Thought you might like a photo of us all in our working attire. We all have armlets although they do not all show. ..." If you press the image to magnify its does show the armlets better. None of the nurses are young. They could well be the matrons in command, and no younger nurse has quite reached the status of sitting with the Mayor. Possibly, they are volunteers during the war and the younger nurses are out at the front caring for the victims of that butchery.